The Bodog brand will surely be familiar to most Canadians, especially sports fans. Founded by the well-known Canadian online gambling entrepreneur Calvin Ayre, Bodog has stood the test of time and continues to deliver high quality online betting. In recent years, Bodog has developed its mobile application so that players can enjoy betting on their favorite sports while relaxing on a sofa, or commuting to work. Bodog offers a wide selection of betting lines. You can follow your favorite North American sports leagues such as the NHL, CFL, or NBA, and also access a hug number of overseas sports events. Bodog covers the most popular leagues amongst Canadian bettors including the NHL, CFL, NBA, NCAA, and others. You also get access to international leagues. There’s a decent selection of compatible payment methods so that most Canadian bettors will be able to make a deposit at Bodog quickly and easily. Bodog have a solid welcome bonus, giving new players a cash bonus of 100% up to C$200. The wagering requirements are more than fair too. We haven’t seen too much in terms of special promotions, but Bodog does offer a refer-a-friend bonus as well as special betting perks during the year. Bodog has a very professional customer service deparment that are familiar with the needs of Canadian bettors. We love the Bodog mobile app. It’s a very smooth platform that looks great and makes betting simple and enjoyable. Over the years Bodog has moved from strength to strength and today the platform is as simple and enjoyable to use as ever. The first thing you’ll notice about the Bodog sportsbook is that it’s easy on the eyes. The color scheme and layout is both attractive and convenient so that you can enjoy the action without getting lost in complicated menus and tweakable parameters that don’t really add any value. There has been criticism of the Bodog platform regarding betting lines. Some users have reported that betting lines are often a bit late to open, but this depends on the event and is not something that will be noticed by everyone. The odds at Bodog are also very competitive, although as with every sports book, this will vary depending on the game and league in question. Where the platform really shines is how its live betting works so be sure to try that out. Bodog is tailored to the Canadian market and for this reason any transactions using this brand are always quick and easy for Canadian players. Besides Visa and Mastercard, you can also use a variety of online transfer services such as Skrill, Neteller and Click2Pay. The Maestro debit card is also accepted as well as American Express, two options that aren’t that widely accepted by online sportsbooks. The digital currency Bitcoin has also been added to Bodog’s payment methods so if you use Bitcoin this could be the perfect sportsbook for you. If you don’t already own any Bitcoins, the Bodog website will lead you through a process to buy Bitcoins and to then directly open an account that uses Bitcoin. The welcome offer at Bodog is on one hand not the flashiest you’ll see advertised, but on the other, is a significant bankroll boost. Bodog’s welcome offer also boasts very attractive play-through requirements making it an appealing choice for any sports bettor. The welcome offer at Bodog is essentially a sign-up bonus that gives you as a new player a bonus of 100% up to C$200. Those numbers aren’t mind-blowing but the rollover for this bonus is only 5 times. As a sportsbook wagering requirement, this is quite low and means that you will be able to enjoy your bonus money sooner than what other sportsbooks will allow. Bodog offers a number of promotions throughout the year so be sure to check their promotions page on a regular basis. The Bodog brand is a leader in its field and has been for a long time. Canada is one of its major markets and since Calvin Ayre, the founder of Bodog, is Canadian, the brand has always been able to understand what Canadian sports bettors are looking for. This follows into how Bodog treats its customers. The support team is friendly and very experienced when it comes to dealing with issues that Canadian players most commonly have. This is important although as a sportsbetting platform that works so well, it’s unlikely that you’ll have to deal with the Bodog support department at all. As mobile devices grew more popular and tablets became more powerful, it was pretty obvious that sportsbooks could only gain from joining the mobile revolution. it seems that Bodog really grasped this opportunity and have worked to allow their sports betting products to convert really well to mobile devices. Betting on a tablet is a lot of fun. It’s so much more comfortable sitting on your sofa than crouching at a desk. A huge plus with the Bodog app is that you can just be watching sports on TV and pick up a tablet to make a bet. This leads us to another strong point regarding the Bodog platform – live betting. Obviously, not every sports event offered by the Bodog platform will also offer live betting, but a lot do and that’s important. Live betting may not be everyone’s favorite way to bet but it’s very exciting, especially when it’s on a sport or team that you love. 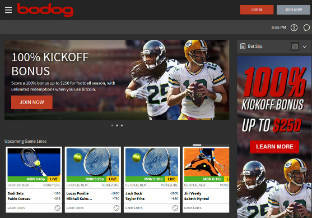 If you’re Canadian and are looking for an online sportsbook, then you really should try out Bodog. For a long while now, Bodog has served Canadian sports bettors with a wide variety of ways to bet, and a huge selection of popular North American sports leagues. Using Bodog, Canadians can also access a large number of leagues from around the world. 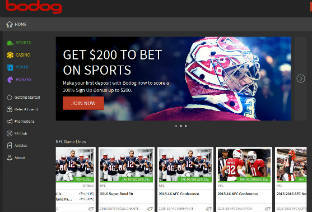 Bodog’s live betting options and the fact that its mobile version is so fun to use, allows this brand to maintain its place as one of the leading online sports books for Canadian bettors. By signing up to Bodog, you will also have access to the Bodog Casino and Bodog Poker sections, making it easy to access other types of betting via a single wallet.